Heat grill to medium high. Grill shucked corn rotating often until lightly charred about 15 minutes. Cool slightly. Cut kernels from cob. Toss corn and avocado gently with cilantro, lime and olive oil. Season with salt and pepper to taste. 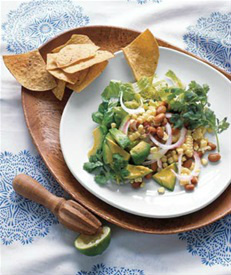 In large bowl, combine lettuce, corn, avocados, beans, onion and cilantro. In small bowl. whisk together oil, lime juice, cumin, 3/4 tsp salt and 1/4 tsp pepper. Drizzle dressing over salad and gently toss. Serve with chips. Heat broiler to high. 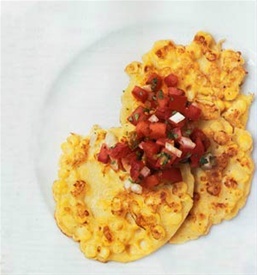 Place tomatoes, corn, onion, and jalapeno on a rimmed baking sheet and broil, turning occasionally until charred, 8-10 minutes. let cool. Cut corn kernels off cob and transfer to medium bowel./ Roughly chop tomatoes, jalapeno and onion and add to bowl along with cilantro, vinegar 1/2 tsp salt and 14 tsp pepper. Mix to combine and serve with chips. 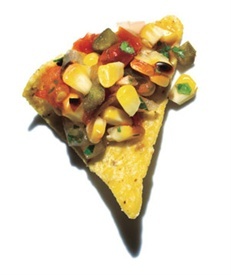 TIP: For milder, slightly smoky heat, substitute a poblano pepper for jalapeno. Just be sure to peel off blackened skin wearing gloves or paper towel, after roasting. For SALSA: Stir together all ingredients and season with salt. Cut corn kernels from ears and scrape cobs to extract juice, then discard cobs. Whisk together egg and milk until smooth and stir in cornmeal, flour, and salt. Stir in corn, including juice. Heat 1 tbsp oil in a non-stick skillet over moderate heat until hot but not smoking. Drop in 2 tbsp batter each for 4 fritters. Fry until lightly browned, about 2 minutes per side and drain on paper towels. Make more fritters in same manner adding oil as necessary. Slice the kernels from the cob. In a large bowl, mix the remaining ingredients. Add corn and toss to coat. Chill at least 1 hour.